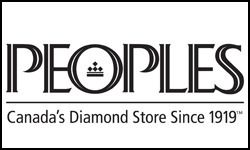 Peoples Jewellers has delivered the best value and knowledge in their exceptional fine jewellery and diamonds since 1919. Today they are recognized as Canada's top Diamond Store. Whether it's a gift for someone special or for yourself, customer satisfaction is top priority. Discover the People's difference today at CF Polo Park in Winnipeg.